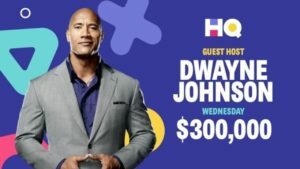 Winning a share of $250,000 in a quiz hosted by The Rock is something you can only imagine in your wildest dreams. With HQ Trivia, it’s not. This actually happened, courtesy of the quiz-based app that’s causing a sensation in North America – and across the pond. 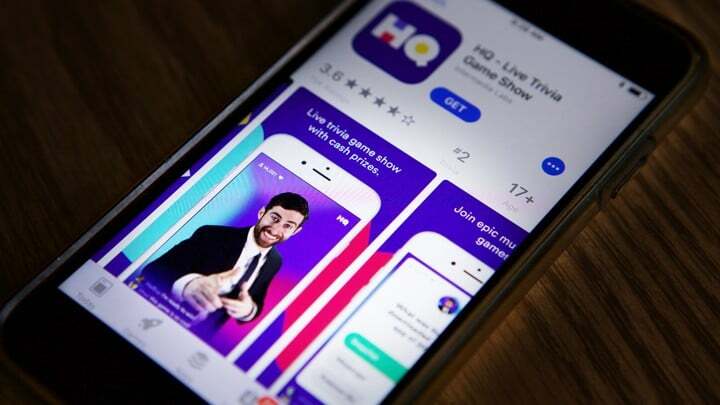 HQ Trivia is a live mobile video game show, available as an app that’s free to download on Apple and Android and it’s got millions hooked on quizzing. From John Mayer to Elmo, celebs and civilians alike are getting hooked. We explore how to win HQ Trivia! From Who Wants To Be A Millionaire to Jeopardy!, we’ve all shouted at the TV when a game show contestant hesitates over an answer before getting it wrong. “We knew the answer! It’s ‘B’, you fool! ‘B’!! 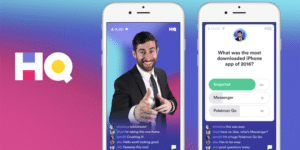 We could totally have won that!” Well, now there’s a quiz show where everyone can be a contestant; and with HQ Trivia, you can play alongside hundreds of thousands of other contestants at the same time. We show you how it works and how to win HQ Trivia! The premise behind HQ Trivia is devilishly simple: download the app, and make sure you clear the diary to play the game at 3pm and 10pm – the times when the quiz is live streaming from a New York studio. There, the live quizmaster asks players a series of 12 increasingly difficult multiple-choice questions to win the cash prize – which could range from $1,000 to $250,000. Sounds straightforward, right? Well, there’s one catch. Players have just 10 seconds to submit their answer, so even the fastest Googlers in town won’t stand a chance. In this giant virtual pub quiz, it’s not teams that are eliminated each round, but thousands of players – and one killer question can see casualties of quizopolyptic proportions as they crash out of the round. The last quizzer/s standing wins the prize pot, which is split between them. Top 10 Tips For HQ Trivia! The opening questions will be easy – take them at face value. If the answer seems to be correct, go with it. It’s unlikely you’ll get a trick question at the early stages. Play with your team beside you! It doesn’t have to be a solitary activity; the joy of quizzing is that it brings people together and encourages some solid team bonding. If you know everything about Pakistani disco music but your buddy is more of a baseball buff, get them involved. More brains = more knowledge = better chance of winning! Never Google! You wouldn’t do it in a pub quiz (well, you shouldn’t), and you wouldn’t have time to find the right answer after reading and processing the question. Trust your instincts; you can’t revise for a quiz. A lot of general knowledge is just luck, common sense…or good guesswork. Using reverse psychology can sometimes work. Sometimes the weirdest or most random answer can be thrown in there to put you off the scent, but remember that truth can be stranger than fiction. Switch off the comments section. It will be a distraction when you’re playing. Swipe them away! 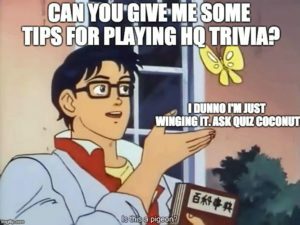 Check the HQ Trivia’s social media accounts, which sometimes hint at possible answers in advance, as well as announcing quiz themes (for example, Art Trivia Night). Keep up to speed on news and current affairs – including any stories that have gone viral and have been trending on social media. One of the joys of quizzing is that it shows an engagement in the world around you, not just in the playing it, but in sharing the knowledge you have picked up, as well as learning new trivia from the quiz questions themselves! Having downloaded the app and entered my details, I ensured the push notifications were switched on so I’d get a reminder of when the quiz was about to start. And then, I waited until it was time to get quizzy with it. Around 5 minutes before the evening quiz at 9pm, I got the reminder that it was about to start, and a helpful little countdown clock started so I could crack open a beer, get comfy, and limber up my trivia muscles. I made sure I turned off the notifications where other players pop up and comment, to keep my screen uncluttered and as Zen-like as possible. The quiz host appears, gives a little intro, and then we dive straight in. Now, don’t wait for the host to read through the question – the 10 seconds you have to answer begin the moment the question appears. There are 3 possible answers – read them carefully before going in for the kill and selecting what you think is the correct one! Q: Which of these is a common food famously associated with Captain Birdseye? After the 10 seconds, the host confirms the correct answer – and you can see how many players chose each one. Interestingly, 321 went with Amphibian Arm. 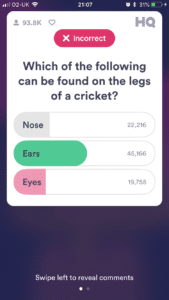 Q: Which of the following can be found on the legs of a cricket? Well, along with 19,755 others, I went with eyes – and it was the wrong answer, so I was out of the game. I was an HQ Trivia div. Have a poke around wikipedia or try our own sample quiz for some more practice as we learn how to win money on the HQ Trivia game app! You do have the option of continuing to watch the game, to see what other questions they ask and how many players end up winning – it’s interesting to see what catches them out. At the end of my game, there were 91 winners – out of over 100,000 players at the start. That’s no mean feat, even if their winnings amounted to £10 each. How To Win HQ Trivia: 12 Questions! Which of these is a common food famously associated with Captain Birdseye? Which of these is a title awarded to the winner of a professional men’s bodybuilding contest? Which of these is the name of a Neil Diamond song covered by UB40? Which of these keys is usually found at the top left of a computer keyboard? Which of the following can be found on the legs of a cricket? Which of these places was at the heart of the global lace industry in the 19th century? Of the 100 largest cities in the US, which is the nearest to London? In Australia, general elections usually take place on which day of the week? According to a 2017 New Scientist report, the male of which of these birds make great “bird husbands”? Which team finished runners-up in the very first Premier League season? 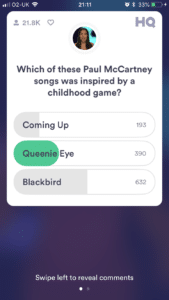 Which of these Paul McCartney songs was inspired by a childhood game? The top US TV awards, founded in the late 1940s, take their name from which of these? Tell us about your experience with HQ Trivia: How to win it and if you have won it get in touch for a shout out on our site! Contact us here.